Drones that attacked Russian air and naval bases in Syria last week were launched from positions held by "moderate opposition," Russia's Ministry of Defense said Wednesday. According to a statement issued in the ministry's official newspaper Krasnaya Zvezda, it sent a letter regarding the incident to the head of Turkey's National Intelligence Organization (MİT), Hakan Fidan, and Chief of General Staff Gen. Hulusi Akar. "The documents indicate the need for Ankara to fulfill its obligations to ensure compliance with the cessation of hostilities by the armed forces under its control and to intensify the work on setting up observation posts in the de-escalation zone of Idlib in order to prevent such attacks by armed [unmanned aerial vehicles] UAVs," the ministry said. 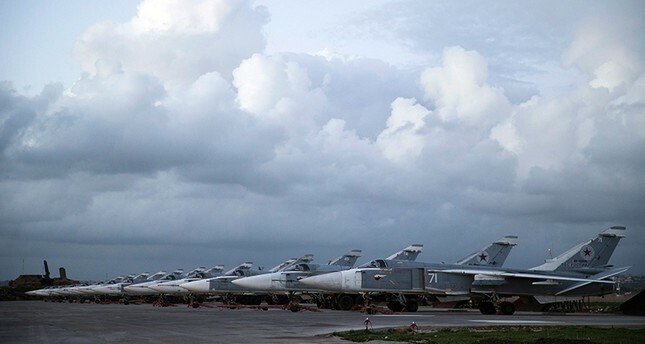 Some 13 armed drones were involved in attacks on Russia's Hemeimeem air base and Tartus naval base in western Syria. Russian defense ministry reported no casualties or damages after the attacks. Meanwhile, Foreign Minister Mevlüt Çavuşoğlu on Wednesday urged Iran and Russia to realize duties as guarantor states in Syria and stop Assad regime violations against the moderate opposition forces in Idlib. Çavuşoğlu said that Russia and Iran have no excuses for attacks by the regime, noting that violations cannot happen without the support of the two countries. Turkey and Russia, together with Iran, are the guarantor countries that brokered a cease-fire in Syria in December 2016, leading to the Astana talks, which ran parallel to the U.N.-backed discussions in Geneva to find a political solution to the six-year war. In September, the three countries agreed to jointly monitor a fourth safe zone around Idlib province as part of the tripartite plan to ease the Syrian conflict that has claimed hundreds of thousands of lives.